"Ultralight Trike" means a high maneuverability and excellent nautical properties. A towed buoy is an inflatable craft without its own means of propulsion. These recreational devices are made in every imaginable shape. 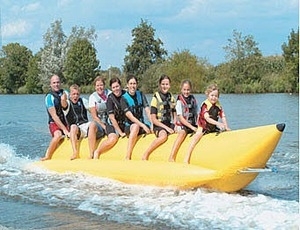 They can resemble jet skis, bananas, boats or other objects. They are used both by individuals and by beach resort businesses. Inflatable models are made of particularly rugged plastic, usually vinyl. Commercial models feature extra reinforcements for increased sturdiness. Riders straddle the device, sit in or atop it. Some models support just the torso, the legs trailing in the water. An aerodynamic shape permits certain versions to become airborne. Commercial models differ from those intended for individual use. They can carry more passengers, are sturdier, more durable and more costly. Of course, the greater the passenger load, the more powerful the tow-boat must be. Flying models must reach a certain minimum speed to leave the water.